I’ve just finished the first block of Sarah Fielke’s 2019 BOM, it’s called Coming Home. It’s a gorgeous design with lots of cottages and trees on. It’s the second quilt I’ve made of Sarah’s, the first being Down the Rabbit Hole, which I am still hand-quilting. 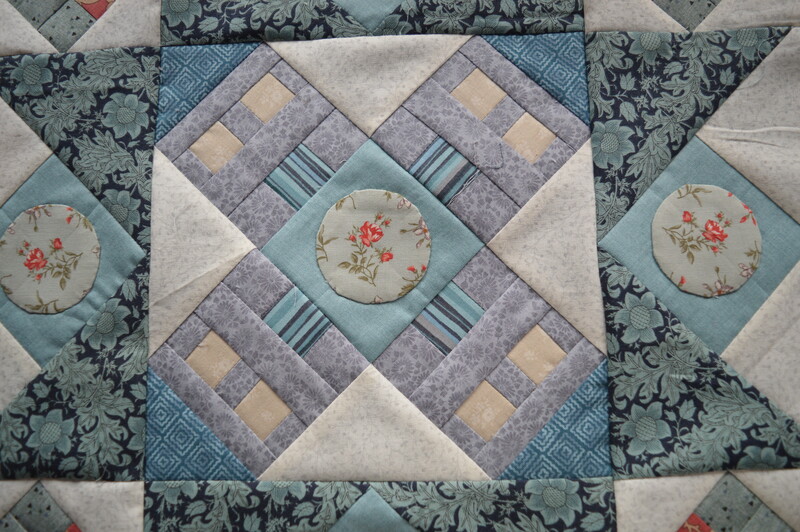 Sarah’s quilts are a great way to learn needle-turn applique as it always features quite heavily on her designs. I’ve started with a box of fabrics in soft teal, grey, purple and peach, I’ve also got background fabrics in light grey and teal, though I’ve already had to add to them! It’s a medallion quilt so we’re starting in the middle with eight pieced cottages. It took some careful cutting and sewing to get those windows square, they’re pretty small! Our applique homework was five circles. These can be quite tricky to get neat but Sarah’s method of using tinfoil wraps works a treat. I fussy cut mine to have a sprig of flowers in each one and then hand sewed them round. I was originally planning to use one of the background fabrics next to the houses but it just looked too dark. I tried plain fabrics in cream and very pale blue but they look too stark. Then I remembered one from my Splendid Sampler stash, it’s ivory with a tiny soft grey sprig, perfect! The block went together fairly easily, it just needed concentration and plenty of time when I wouldn’t be interrupted or rushed. I found my block book very helpful in holding various components safe whilst I worked on another area. I’m pretty pleased with how the colours have worked out so far and my points look OK too…and even more important, it’s exactly the right finished size, ready for the next border. It’s now sat patiently waiting in my quilt block book for part two to be released at the very end of the month. 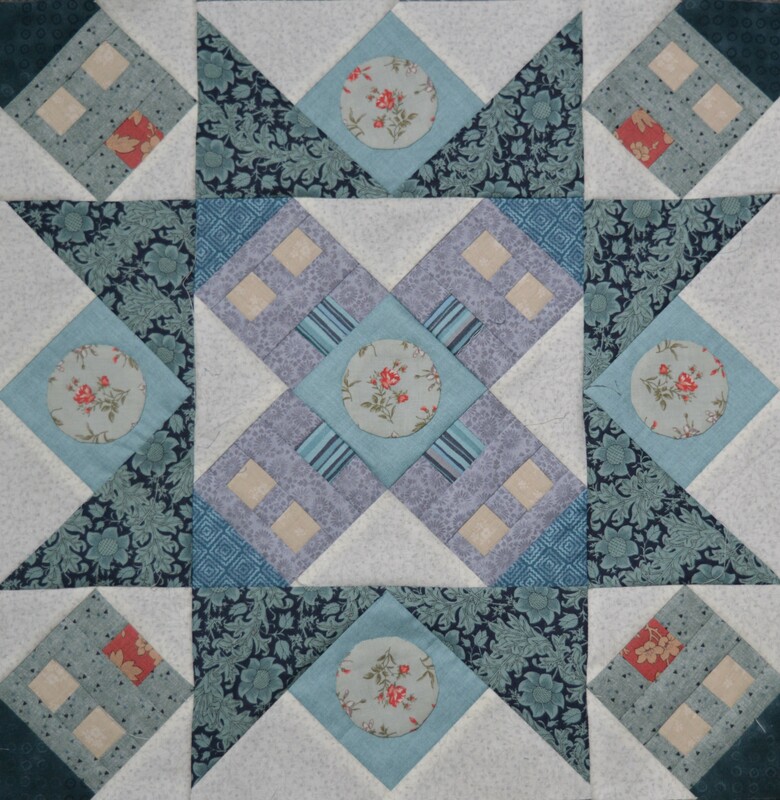 This entry was posted in Coming Home Quilt, Quilt-a-long, Quilting and tagged #cominghomequilt, #sarahfielkebom. Bookmark the permalink. That little flash of coral red really lifts everything! It’s lovely–you really like these sorts of subtle, dusty color–makes me think the the Rabbit Hole quilt, too! This is just fabulous, you are just so skilled. That is a wonderful design! Can’t wait to see what the borders are like! A very beautiful start, Margaret, with beautiful subtle colors. I will enjoy watching this unfold!! Lovely colours and the coral definitely adds a certain something. You have inspired me and I have now joined a swap called – tell me a story – I have to make a number of blocks and send out to people. We then put all the blocks together to make a quilt. I might come knocking for advice at this point! The fabrics made me gasp when I looked at them – yum! I love the piece and love your color palette! 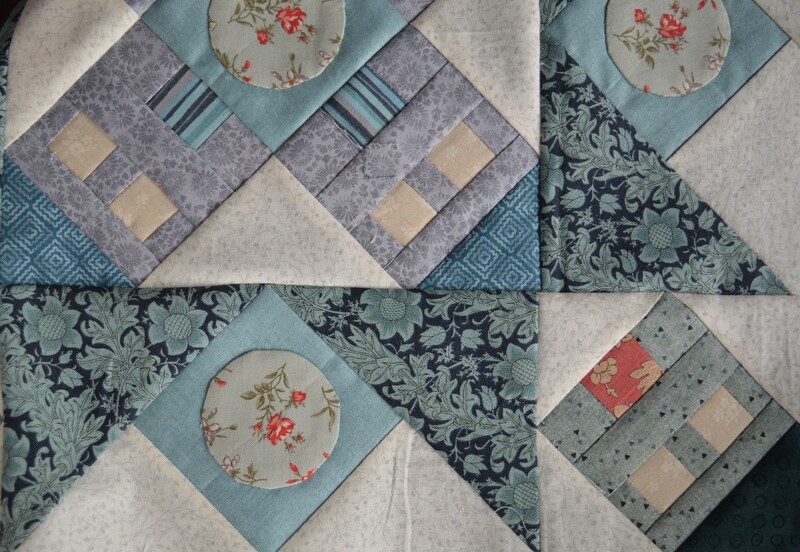 I am also making this quilt…making the first block is this week’s project. It has been fun seeing everyone’s blocks on Facebook. Your block is lovely. The houses look wonderful on the background fabric. I have some colour ideas for my houses …I have a palette chosen…I need to just dig in and get cutting and sewing. Needle turn applique is next on my list of hand-stitching skills to learn. Your circles are lovely with their fussy cut flowers!